We have in our house two iPads and the last few days I tried to use one of them as a notebook replacement. As we know you can get over 60,000 applications for the iPad. But I did limit myself to only the most important application to fulfill my task. I tried to imagine how it is to have only an iPad and no other device. Which I did a similar attempt last year, but back in time the iPad was not so good and less apps available. I decided to try it again. Therefore I reseted my mother in law iPad, to start from stretch. The first step failed, I had to connect the iPad to a computer with iTunes to activate. To pretend having no computer, I went to the Apple store. These guys were really nice. They offered me (free) to activate my iPad, however I had to have am appointment with the genius bar. I scheduled the appointment directly at the store using one of their computers. 2 hours later I had my appointment. They activated the iPad and gave me some important tips how to use the iPad and even did set up my exchange to use my office email and calendar. Next step, I went back to the office and tried to install software I thought I might need. Pages, Numbers, keynote, photoshop express and dropbox. Less than $20 in total. Good price to have a complete office version on the ipad (contacts, calendar and email come free with ipad). Unfortunately I was not able to install any of the production apps. They are all between 51 and 69MB. Our company wifi is not open, so I could only use 3G but over 3G you can't install apps over 10MB, at least with ATT. I had to go to the nearby Starbucks to use their Wifi. Was not to bad, at least I got a good non fat latte. All apps installed easy and I was ready to use my iPad for work. Back at work I got an email with a link to a document in our intranet which is SharePoint 2010 based. I clicked on the link and the document opened in my iPad. Awesome. I even could open it in pages. I made my changes in the document and went back to our intranet. I am amazed how well SharePoint works with Safari. SP 2007 did only work with IE. But here came the problem I could not upload my document. The choose file button was disabled. I had to email the document to somebody in the office to do the upload for me. Next somebody asked me to help with CRM. 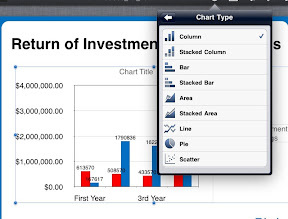 We use Dynamics and unfortunately it does not work with Safari and we don't have the mobile version activated. 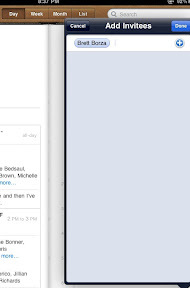 This is not really and iPad problem but a Microsoft issue. Not a big problem, I had as well at Starbucks some more apps downloaded like instant messenger, Skype and LogMeIn and blogspot. 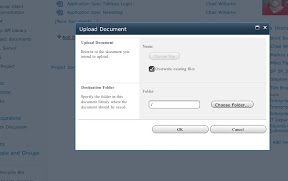 I chose to start LogMeIn ($29.99) to connect directly to the CRM server to run the browser there to help with the user issue. LogMeIn is expensive but powerful and necessary. There are other RDP programs and even cheaper, but we use LogMeIn in the company as our tool for user support and I knew it will work as long I am in our wifi domain or over VPN. Reading email worked fine, but handling meetings is a pain. I could not see when I created a meeting, if the attendees are available at my proposed time or if one of our conference rooms are free. Maybe I don't know the ipad calendar good enough. But it seems the calendar is not usable for company use. I ended up using our outlook web access for calendar and notes. I had as well to use the outlook web access to switch my out of office assistant on. It is a work around but it worked. I had to do a presentation at my meeting and used a PowerPoint presentation I got from somebody. But before the meeting i made some changes on it. Keynote did open the presentation, but because keynote is not PowerPoint some fonts were off and missing and the transitions did not work well. I basically had to rebuild the whole presentation but I can tell, keynote results are looking so much nicer. I have to admit, pages, numbers and keynote are very limited on the iPad it is not comparable with the full apple version. Keynote is missing as example all 3D effects. Presenting the presentation and even switch between programs and browser worked pretty good using the video cable and adapter to our projector. The complete iPad is mirrored. Overall using the iPad at work does seem to be possible with some hurdles. It is not possible to use the company shared drives, but I could use dropbox or mobile me to share documents with others. I guess companies which are not so heavy on in-house systems and are using a lot of browser based apps might have it easier to integrate the iPad. The next tasks came at home. Still pretending not to have any other computer, I started my process like every day. I ate with my family, played with my son and after he went to bed I started to write my blog. I had to do research for a blog entry. The website page, which would have the answer I was looking for,was done in flash. I was screwed. From home I am not able to use LogMeIn because the VPN does just not work. It says i am connected but our firewall at the office does think different, otherwise I could remote to one of our windows server. However this would be anyway not good hence my research is private. 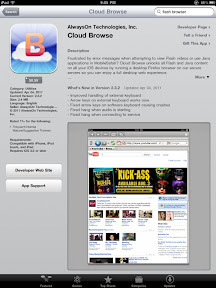 I decided to buy cloud browse. Which is basically the same as RDP but only within a browser to another remote browser. I could now see the flash page. In the meantime I opened the present my wife had for me. A new DVD, the A-Team. Awesome, but stop. How do I get it into my media library? I use of course iTunes on my iPad. But I don't see a DVD drive I can connect to my iPad to rip the DVD and to put it into my media library. I guess, when we have iPads we don't buy DVDs anymore. Ok this is cool.I just need to rethink. 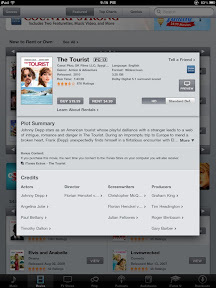 I opened iTunes on the iPad and was able to rent or buy a movie. It downloads the movie directly into your iPad. Now my iPad is only 64GB (biggest you can get). An HD movie is around 3.5GB, in best case if only use the iPad for movies, I would get 16 movies on my iPad. But what is when the hard drive is full? When you buy movies you don't want to delete them. Apps bought from the app store can be downloaded all the time, but the movie I downloaded, if I lose the movie, I have to buy it again. There is a flaw in the system. I can on the computer (at least) claim in iTunes I lost the movie and download again, but only once. And you need to have a computer to get the iTunes extra. It is possible to have only the iPad and no other computer but it is no fun. As long the iPad is so strong connected to iTunes and iTunes the only way is to get your data off the iPad to store, as long you need to have a second computer. I could move all in the cloud, using flickr mobile.me, for my photos and dropbox for my files and Netflix to stream movies. Plus a cloud backup. And this might be the future. But if you have no wifi router at home or a bad wifi connection like me than it is no fun. And it it gets expensive most of these service cost money. A 320GB hard drive cost $80. Mobile.me is $99 per year and backups in the cloud cost another $120 a year. I get for this two hard drives with more GB. 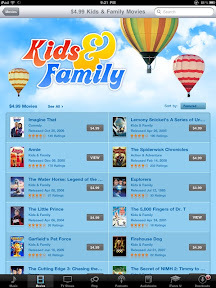 I think as soon iTunes goes into the cloud and the movies and backups are getting cheaper then the chance is good that the iPad could be the only computer in a household. For work it is even a longer way to use the iPad as the only computer. It does not fit well in a Microsoft and on premise software environment. But most American companies are in this environment. I can see the iPad in some cases as the only computer, like for airplane inspection or in hospitals, schools and kindergarten or other niche markets where standard software and document sharing might not be important. For these cases the iPad can be a good replacement, which we already see. NJ bought for one kindergarten for all students iPads. Mercedes Benz bought for their sales team iPads (MB built their own app for this). But otherwise IT would need to build a whole infrastructure and software around the iPad to integrate it better into company infrastructure and this is right now almost not possible and very expensive. I think we still need 15 months till we see the replacement seriously starting. BTW I did not talk about printing, because I almost never print. The iPad has the print function but works only with a few printers. Non of them I or my company has. Cool story bro! I tried using an iPad 2 as a laptop replacement and it just wasn't working for me either. Typing on it was a pain.